Children went on about life seemingly oblivious to us and the war around them. my name is Michael Floyd. was stationed at ramason Thailand, and fathered a child with nong lock wa de silisoc in 1974-75. radio relay field station near udorn. the child was born in 75 her name poncho and been looking for her for years. can anyone help me. she lived in soy som pon. I left and never heard anything from her again. please help, I have cll, and finding my daughter poncho would mean the world to me before I die. I have a friend whose husband was saved by an American GI. That GI brought back my friend, his mother and a brother. The GI became his adopted father. I found out the story when I asked my friend why her husband's last name as American (he is Vietnamese) and she told me this amazing story. He just took his family to Vietnam - his first visit back since he left at 11 years old. Although this is difficult to admit on public forum, I see these photos of the kids and it rips my heart out as I wonder if they survived and what are they doing now, if so. I have carried these emotions with me for over 45 years and it does not get easier. I have many similar photos (from other sites) that I included in my personal DVD documentary of my time in Nam. Children are always the victims...I hope they grew without scars. I saw the children of Viet Nam in 1967 as an 18 year old American soldier. I was surprised at the number of children after TET in the Hue area who appeared to be orphans. I was astonished to see so many children with smiles who had not forgotten how to play in spite of the war. Years later, when I became a parent, the memories of the children haunted me. I remember when Sa Lang, a Vietnamese mother, told me that she wished foreigners (Americans) would leave her country. She cried when talking about the suffering of the children and families. I was young and thought I was helping the world by being there. In early 1968 I discovered that I was the universal soldier....and that our war efforts were hurting people more than they were helping people. ...The lessons of youth...sad for the children. I was born in 1969 my father and several uncles were in the service they never spoke about vietnam this is a way for me to learn about what they find too panful to speak about. i believe i can touch the sky!!!!! The pictures of all these galleries are not only very impressive and informative, they also show your talent in composing. Congratulation! Vote. I viewed each one feeling the weight of their time in life. Fantasic summary of the human side of this. Such innocence in the midst of conflict. 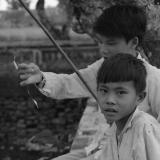 Richard ... great shots of Vietnamese children. In my Potpourri gallery, I've got some shots of an orphanage we used to sponsor about 20 miles outside of Saigon. Every time I look at those old shots, I can't help but wonder whatever became of them. A long time ago ... glad you made it back safely. Those who were air-lifted after the fall in 1975 came to army depots across this country. I was a 24 year old teacher in rural Pennsylvania when 45,000 Vietnamese refugees were brought to our area. I remember their faces as if it was yesterday. Your work - all of it - has given me so much to ponder. Beautiful and skillful and truly memorable images. What a document...! amazing photos! a look full of simpathy. very true fotojournalism here. bravo and a vote! What a gem. You have my vote. The one good thing is that the children WERE so young and seemingly oblivious to the chaos going on around them. I have to wonder where they are today. Fantastic reportage photography, Richard, and so very touching! Thank you once again for sharing with us all. My big vote for this gallery. Very true and touching images. Yep, the ones that landmines and napalm let live. Kids are the future and they are the same where ever you go. Voted for this gallery, too.